Wobble Palace - BUY THIS DVD! Days before Halloween and America s traumatic 2016 election, a couple on the verge of a subversive break-up decides to split their house up over the weekend and test the turbulent waters of independence. Desperate to make new connections, Jane and Eugene find themselves in a series of unpredictable misadventures, ill-advised quixotic sexual escapades, and emotional traumas. 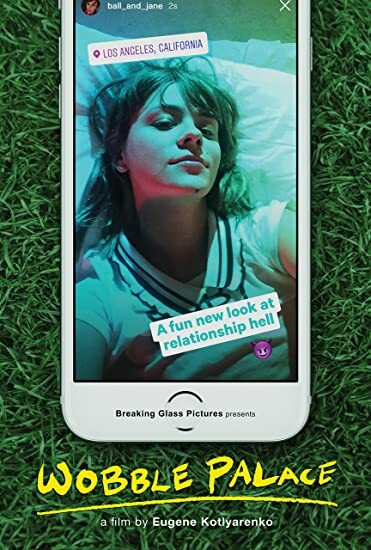 From this simple premise, Wobble Palace charges headfirst into a manic and hilarious world of lust and mistrust, revealing the identity crises and narcissistic self-loathing that lies at the core of the millennial experience. Cinematically the film is a mashup of styles using hand-held vérité footage, and frenetic social media sidebars that reveal and mirror the in-the-moment digital tethers and tentacles of the characters. THEN SEND IN YOUR NAME AND ADDRESS TO contests@efilmcritic.com. Put "I LIKE TO WOBBLE" in the subject line and cross your fingers. We will draw names and one of the DVD packages could be yours. Only 1 entry per household.